Alloy Yachts has just launched the 56.4m sailing yacht Mondango 3 for a repeat client. She is the second launch for the New Zealand yard this year, following the 44m sloop Encore in April 2013. The construction of Mondango 3 (hull number AY46) started in November 2011. She is the successor of a 51.7m sailing yacht launched by Alloy Yachts in 2008, which is currently for sale with Dubois Yachts and Burgess. Like her predecessor, the new yacht is Lloyd's registered, built in aluminium and designed by the same successful duo. Dubois Naval Architects is responsible of the naval architecture and the exterior styling, while Reymond Langton has worked closely with the owners to create an innovative interior. Mondango 3 has a Southern Spars carbon mast and boom with sails by North Sails, and in case of light wind, she will be powered by a single 1,450hp Caterpillar C-32 engine. Other technical equipment includes bow and stern TRAC thrusters and twin Northern Lights generators. 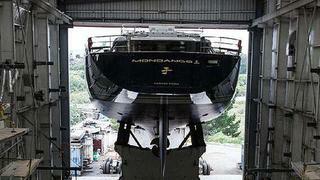 Mondango 3 is currently being shipped to Viaduct Harbour in Auckland where she will be officially launched. Stay tuned.